Well the week has finally arrived! The iPad has been placed down before the public like a nice warm breakfast after a long night of drinking. Marvel is even boasting with great pride that the Marvel App in the iTunes App store has shot up to the number 5 highest download since the launch of the iPad. Here are a few things that Comic Industry people are saying about the product via Twitter. @Rob_liefeld -YOUNGBLOOD looks amazing on the iPad! The colors and resolution are amazing. 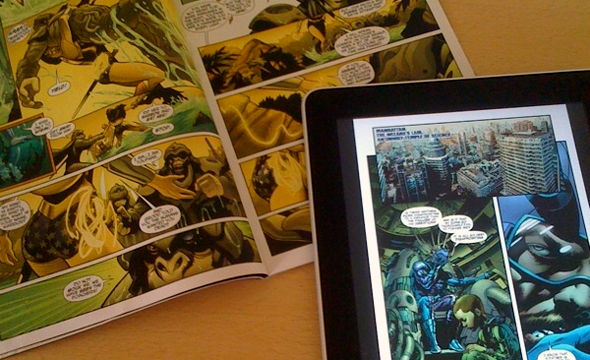 @Brubaker – iPad seems cool so far. Surprised how good the comics apps all looks on it, how good the pages read that size. Still, not as good as print. @BRIANMBendis – Sunday and my iboner has not subsided. the battery on this thing is a dream come true. Now as many of you know I am a big supporter of the Digital Comics movement. But do I feel like this is 100% the best way to do them? Not really. More then anything it has me asking questions like “Where is DC Comics?” and “Your charging this much and this is it?!”. While I understand this is new territory for these companies I don’t see how they aren’t thinking bigger. There is so much more that can be done with comics via digital comics that it is almost incomprehensible that Marvel,DC,Image and Dark Horse (to name a few) have not jumped on! Below are but a few ideas I would love to see incorporated into the iPad. Subscriptions – Hey why not use it like a Magazine company and have it delivered directly to your iPad on a monthly basis.Which leads me to my next improvement..
Day and Date Delivery – If I am going to subscribe to a comic and I am obviously a comic reader why wouldn’t I want to get the digital version the same day it hits the stores? !This is a big one for me. And you would think and obvious one for the companies but I guess not!? *Hint* It should be! Commentary/Play list – You have the ability to charge more for a comic….and your not taking it. Interesting coming from companies that gave us foil embossed gate fold variants of comic. Why not throw in a separately recorded audio track of the writer and artist? And if you don’t like that then at least link it to your itunes so you can make a play list for your comics. Linking – Again you can look at these as almost web pages and have links to other issues you are referring to just like you do now in the corners of the panels..only now they can just buy the comic directly! Cloud Boxes – I would love to see them basically have a saved tag of every comic you buy BUT it is stored in the computing cloud. In other words all the extras and bells and whistles are stored on your computer but the comic in it’s basic form is stored via cloud computing. If anything every happens to the HDD you just sign back in and re-download all your books.This could be done via a subscription which would also give you an @marvel or @dc email address attached as well as special limited downloads available as a first come first serve deal. These are but a few ideas that I would love to see all of the companies really realize. Digital comic really do have a full potential but they are just barely looking at the tip. I also would hope they would work out something with Comic Shop owners, something along the lines of a download kiosk that is in store and thus gives you the comic at a discounted download price because you actually go to the store.If they even start doing half of these things I think you could see a new Golden Age in comics emerge from the grave just like so many of comics characters …stronger and better than ever!